SYNOPSIS: This prequel to 2001's "Monsters, Inc." looks at the relationship between Mike and Sulley during their days at Monsters University -- when they weren't necessarily the best of friends. Violence/Gore: Several scenes show monsters trying to scare both simulated kids and real kids (who do indeed scream). Dean Hardscrabble is a little frightening, and a few scenes show mild bullying and fraternity pranks. Profanity: Mild insults between characters and the various fraternities competing against each other. Drugs/Alcohol: Some scenes imply college partying with loud music, disco lights, and characters holding red cups, the contents of which aren't discussed. Which Kids Will Like It? Kids 6 and older who like "Monsters, Inc." or Disney Pixar films with colorful characters. Will Parents Like It? This movie is fun, entertaining, and beautifully animated. REVIEW: You never know if a sequel or prequel will tarnish the beloved original movie, but no worries on that score when it comes to "Monsters University," Disney Pixar's prequel to 2001's "Monsters, Inc" is sweet, entertaining, and stays true to the original movie. The story takes place prior to "Monsters, Inc." We meet the young Mike Wazowski (voiced by Billy Crystal) as a kid who idolizes the professional scarers during an elementary school field trip to the Monsters, Inc. factory, where a top scarer encourages the kids to attend his alma mater, Monsters University. He even gives little Mike, who sneaks into one of the kids' rooms, an official MU cap. Still, Mike is kind of pushed around and bullied as a kid, which makes me feel sad for him. But Mike hangs onto that cap and, years later, takes it with him to Monsters University, where he at long last fulfills his lifelong dream of being a student there. He and his new roommate Randall (Steve Buscemi) end up in a class with an imposing but goodhearted young monster -- James P. Sullivan, a.k.a. "Sulley" (John Goodman) -- who has a family legacy of brilliant scarers. At first, Sulley and Mike don't exactly hit it off. 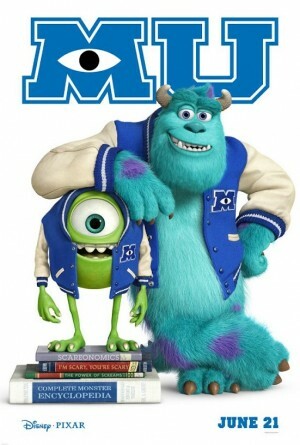 Sulley is a natural when it comes to scaring, but Mike has to study hard and hit the books. On the day of their final exam, the stern Dean Hardscrabble (Helen Mirren) throws them out of the scarer program, and the two end up in the way less entertaining "scare canister" program. It's like the mail room of scaring. But Mike and Sulley aren't down and out yet. They decide to join the annual Greek Scare Games and, against all odds, attempt to lead their newfound fraternity of misfits, Oozma Kappa, to victory. Of course, being a family movie reviewer, my main concern is always how well a movie plays for kids, and whether the MPAA rating is on target. "Monsters University" is rated G, but in my view, it should have been rated PG because of some mildly scary scenes here and there. Nothing huge -- we're not talking "Paranorman" or "Monster House" type fright -- but just enough that I think it's best for kids aged six and older. You've still got monsters who sneak into kids' bedrooms at night and scare the heck out of them. That might be too much for little ones. But other than that, I absolutely loved "Monsters University." There's a lot to work with when you combine good-natured monsters -- especially monsters we know and love -- and college, and Disney and Pixar take full advantage of the palette, from football to fraternities to frat parties to mascots. And the fraternity misfits are hysterical, including two-headed Terry (Dave Foley) and Terri (Sean Hayes), mama's boy Squishy (Peter Sohn), older student Don (Joel Murray), and U-limbed Art (Charlie Day). Combined with Mike and Sulley, they're the group you root for and hope they beat the odds. The message for kids? There's no one type of scarer. Everyone is valuable in their own right, and the best scarers use their differences to their advantage. "Monsters University" is cute enough for kids, but also entertaining enough for grownups. Kudos to Disney and Pixar for giving us an origin story worthy of the franchise, and for making us love these characters all over again. Get in your seats early enough to watch the trailers, which include "Turbo," "Planes," "Frozen" and "Despicable Me 2." But especially, don't miss Saschka Unseld's beautiful short, "The Blue Umbrella," a sweet and simple tale of friendship, teamwork, near tragedy, romance, and impossible odds.